Axiom Verge is a fantastic Metroid-style action title which really belongs on a Nintendo system, and if former NoA employee Dan Adelman - who is in charge of PR for the game - is to be believed, it's only a matter of time. They've been nothing but great. They've been congratulatory. I'm going to go out to lunch with a couple of my old coworkers sometime next week. They'd like to have it on a platform, so that's something we want to work towards. 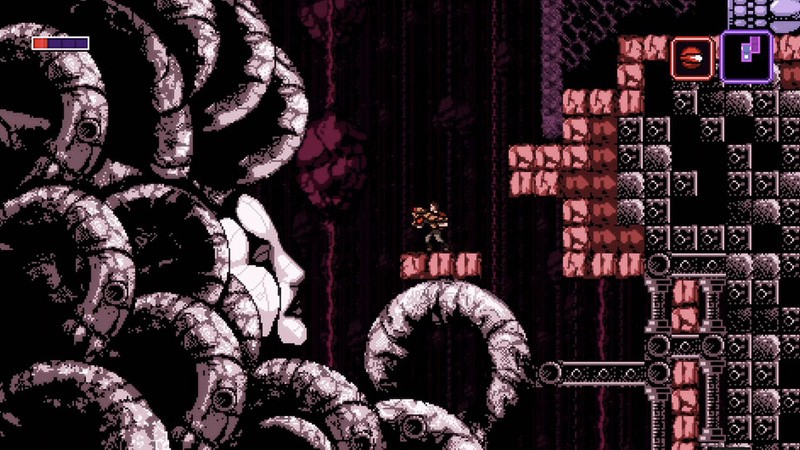 Not so long ago, Adelman said developer Tom Happ - the one-man team behind the game - is keen to bring it to Nintendo systems, but the issue is that Axiom Verge has been built using MonoGame - a game engine that neither the Wii U or 3DS currently support. Still, if Nintendo have been in touch and made positive noises about getting Axiom Verge onto one of its systems, surely it's not going to be long until we get to see how this critically-acclaimed release compares to Metroid itself. Was it using the Unreal 4 Engine by any chance? @Damo Thanks for imforming me, I had just looked it up and found out about MonoGame. I wonder if they could get someone like Curve in to port it. I've been playing it on PC and it's so deserving of all the praise it gets. Fantastic game. I've seen gameplay of the start of this game, and it's fantastic. Looks fantastic! Steamworld Dig and Metroid combined! Insta-buy on Ninty consoles! If Nintendo wants this, then maybe the Metroid plans discussed at the end of last E3 were scrapped. Monogame - Write once, play everywhere? @Grumblevolcano I was just thinking the same thing. Hopefully we're wrong and we get ourselves that long overdue 2D epic. So... Nintendo want it on a Nintendo con, because they know they don't have anything for Metroid yet and this will sooth thirsts for now? I'd be very happy to be able to play this on Wii U. Both former Playstation console exclusives I got on the e-Shop, Guacamelee and Don't Starve, have impressed me a large amount. Hopefully this continues the trend. This should be able to run on both the Wii U and 3DS, and would do very well on each. Does this mean they won't release a 2D Metroid and just want an easy fix? I already bought this game on PS4. Metroid might be a nice way to fill that Metroid void Nintendo. This looks awesome, but you can't replace a true Metroid title. At the very least I'd miss Sammy too much. Looks sublime. I think Metroid will stick to the Prime approach, now that they've found great shooter controls in Splatoon, that serve for scanning the environment as well, and quick precise reflexes in tense situations. Metroid should, imo, remain a modern series with a 'realistic' art direction. It could use some slower paced, scarier sections a la Zombi U's better parts. I imagine that Nintendo will be paying someone to port this as soon as it can. /me wants a Metroid-style game. Great game, I still need to go back and finish collecting everything. 3DS all the way. MUCH larger install base and this game would look pimp in 3D. Wouldn't be surprised if Nintendo wants this because they currently aren't working on a Metroid title and wanted to quite down some restless fans. I bought it day one on Steam, but I will still buy it day one if it comes to either Nintendo System. I own multiple versions of almost every other Metroid game, so why not? Yeah; I think it would be a good fit for the eShop. If Nintendo are serious about this they should help get the MonoGame framework running on their systems. Some of the best 2d platformers in the last several years have been made with MonoGame. Porting to a different engine is a lot of work, especially for a game with a sole developer. I want it on WiiU so very much. Looks great! And on Wii u please! Obvz teh grefiks r 2 xtream 4 teh 3DS and Wii U, y elz u tink it xlusive un PC muzder rase and nex gen sys? Ow, that seriously burst a blood vessel in my brain. Seriously though, I would love a Nintendo release of Axiom. I've considered a Steam purchase, but I'd much prefer playing a 'Nintendo' game on a Nintendo system. Part of me wishes that new Metroid would be a new 3ds exclusive. I need one last good reason to buy this thing. I'm still trying to convince myself that I don't need it.